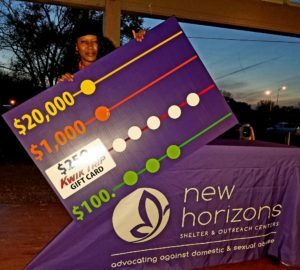 New Horizons wrapped up Domestic Violence Awareness Month activities last night by celebrating success in many ways–hearing the story of a fierce domestic violence survivor, and seeing three members of the community each win substantial prizes thanks to the sponsorship & underwriting of Kwik Trip. At the final gathering Wednesday night at Copeland Park in La Crosse, the crowd listened to domestic violence survivor, Cheryl Killilea share her story of overcoming her fears and uncertainty to break out of an abusive and unhealthy relationship, which set her onto a path of rediscovery and creating a new successful self. After Killilea spoke, the contest in which the finalists would each have a shot at winning up to $20,000 started. The first qualifier, Madelyn Gustafson of La Crosse came the closest to winning $20,000 matching three of five tokens for the jackpot. 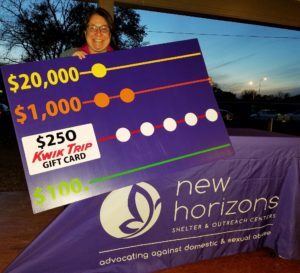 She ended up matching five tokens to score a $250 Kwik Trip gift card. The second finalist was Samantha North of Ettrick. She pulled almost immediately five matching tokens to also win a $250 Kwik Trip gift card. The third finalist was pulled from all who showed up to register at last night’s finale. That honor went to Leyonda Busby of La Crosse, who appeared to be on her way to win $100, but ended up matching five tokens for a $250 Kwik Trip gift card as well. 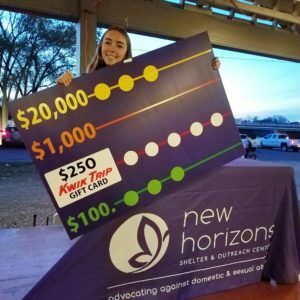 New Horizons would like to thank everyone who participated in the kick off walk on October 3rd, anyone who took one of the Daily Domestic Violence Quizzes online during the month, and of course all who came out to the final event last night at Copeland Park.